An aerial view of Chatham Maritime, taken by Graham Scarfe in April 2009. Please scroll down for annotated version. 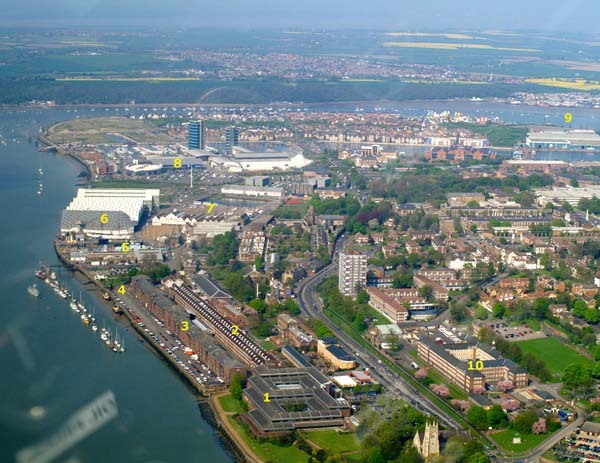 All of the area left of the road and at the top of the picture was the old HM Dockyard, Chatham, which closed in the early 1980s. The lower river frontage is now the Chatham Historic Dockyard. At the top of the site there has been extensive housing development on St Mary's Island (after thousands of tons of 'contaminated' earth had to be removed and safely disposed of - a legacy of the dockyard's nuclear submarine building).